Family reasons have brought me to Montreal numerous times a year in the last few years. Occasionally I get out to try a new shop like Harricana, but usually I don’t have time to check out the beer “scene”. This means the beer I get to try is what is available, which on a recent trip included Molson Canadian, Corona, and Moralité IPA by Dieu de Ciel. Moralité is of course new school, a big-flavoured West Coast-style IPA with everything in the right place. Also essayed was a half-litre of the brown ale at long established (25 years) Les Trois Brasseurs, the French-owned brewpub chain.The brown beer from Trois Brasseurs was excellent, earthy and full-tasting, to my mind a Munich dunkel-type although I’d guess the fermentation is more in the ale tradition. Generally, the house yeast (every branch I’ve ever visited at least outside France) has a strong taste, sharp and doughy. This was in evidence certainly in the bar’s beer “of the moment”, a German helles-style. 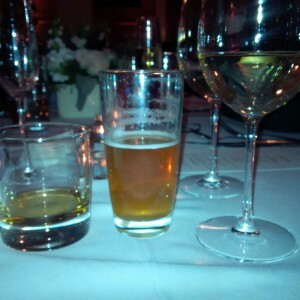 The brown beer though had very little of that noticeable. 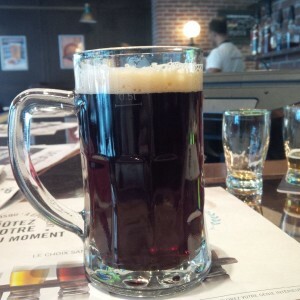 Les Trois Brasseurs should make more beer in this way. As a traditional brewer – all-malt except for wheat styles – using obviously top ingredients and brewing onsite, the beers have every reason to be as good as beer comes. However, the particular yeast signature does not add to their attractiveness, in my opinion.The bar itself, downtown on Ste. Catherine Street, was attractive, clean and efficient with the stylized beer hall atmosphere the house has perfected in two continents. (Personally I’d take down the garish sports screens though). The Corona was at a wedding and good enough, not light struck effect and better than I remember it. It was fine with hors d’oeuvre. 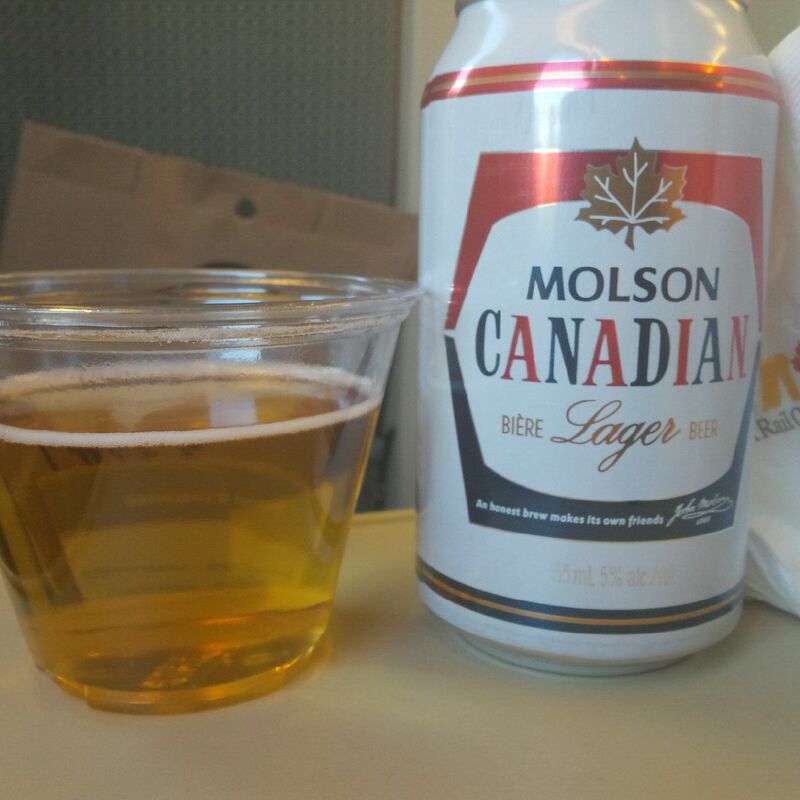 Molson Canadian on Via Rail had a good beerish taste, the hops quite evident with even a slight flowery note. The yeast background can at times have a strong, dimethyl sulphide taste (over-cooked vegetable), in my view. This sample had almost none of it though. I did notice a slight ferruginous note on the tail, like water from a rusty pipe, though I doubt most people would notice it. An excellent mass market product which retains its popularity for a reason. Molson Export ale, formerly the senior member of the Molson brand range, was very disappointing, a canned sample with a thin, starchy taste – very different from the “Export” I remember from the 70’s and 80’s. I had two sips and left it on the counter. The beer I recall had an earthy note with more malt and hops. 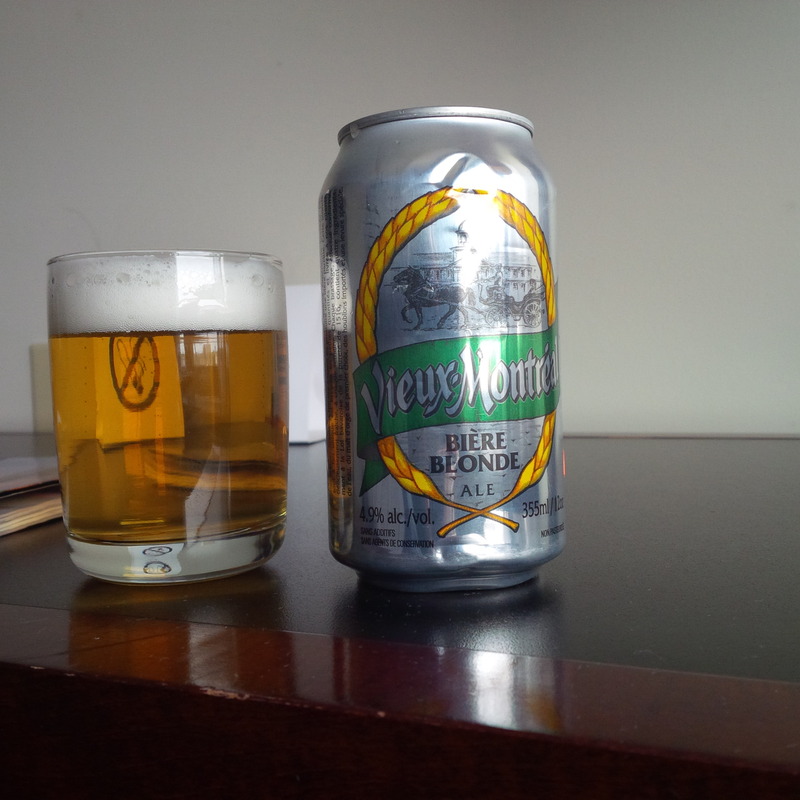 Finally, there was an all-malt pale lager called Vieux Montreal, from BVM, in business since 2000. A well-made “blonde“, the kind of beer you could get as a demi at one time from a local brewery in France, and probably typical too of older (pre-1970’s) North American lager at the quality end. And so, a pot-pourri, of the old school and older part of the newer one. It can be worse. Sorry to hear that your recent sample of Molson Export ale was less than satisfactory. I recall having one on a Via Rail voyage as well (!) some 20 years ago, Ottawa to Toronto, and it was excellent. Fruity, flowery, and complex (and super-fresh). Do you buy this on occasion in Toronto? In other words, is your recent experience indicative of the current state of “Ex”? This sample was from Montreal Alan. I’ll try it in Toronto but not holding hope for much better… Your recollection is similar to mine! 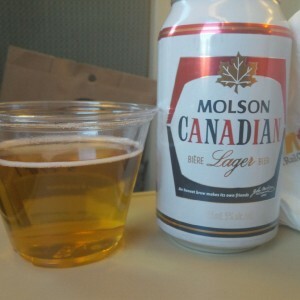 However, Molson Canadian is very good (for its type) and if anything seems to have improved.